A mild confusion erupted on Saturday at the annual Ojude Oba Festival as one of the high chiefs of Ijebu-Ode slumped during the ceremony. 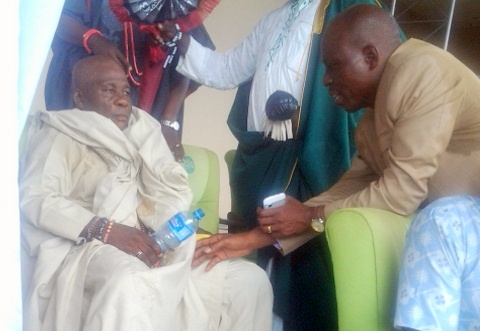 According to premiumtimesng,Alade Shote, the Osi Balogun of Ijebu-Ode, slumped at the VIP section of the Oba Adetona Pavilion of the city, venue of the ceremony. Earlier, Mr. Shote rode a horse to the venue, like other traditional chiefs, to pay homage to the Ijebu monarch, Sikiru Adetona, as part of the custom associated with the event. He later joined other dignitaries at the VIP section. After he slumped, he was rushed to a separate section of the venue where he was attended to by a medical team from the major sponsor of the event, Globacom. Mr. Shote regained consciousness about 30 minutes after he was attended to and was subsequently taken away from the venue. One of the doctors was heard by PREMIUM TIMES saying a follow-up treatment would be administered at the chief’s home. The Awujale of Ijebuland, Sikiru Adetona, in his speech said the Ojude Oba festival symbolises the unity and peaceful co-existence among the Ijebus. He thanked the sponsors of the event and appealed to the Ogun State Government to efficiently repair roads in the area. Some personalities at the event include the Ogun State Deputy Governor, Yetunde Onanuga; Bayelsa State Governor, Seriake Dickson; former Ogun State Governor, Gbenga Daniel; and former Bayelsa State Governor, Dieprieye Alamieyeseigha.